1. HIGH QUALITY MATERIAL:Mainly constructed of aluminum alloy material with CNC processing, solid, firm and durable to use. 2. OPTIMISE VIEWING: Secures your edge bike computer in front of your bike handlebars to optimise viewing. Enables you to easily view performance data on your edge bike computer. 3. EASY TO CARRY: Compact, lightweight and multi function with stylish design, easy to carry and use, can easily installed on bike handlebar stem. 4. COMPATIBILITY:It is a extension mount holder for computer and sports camera and other accessories. HIGH QUALITY MATERIAL:Mainly constructed of aluminum alloy material with CNC processing, solid, firm and durable to use. OPTIMISE VIEWING: Secures your edge bike computer in front of your bike handlebars to optimise viewing. Enables you to easily view performance data on your edge bike computer. EASY TO CARRY: Compact, lightweight and multi function with stylish design, easy to carry and use, can easily installed on bike handlebar stem. 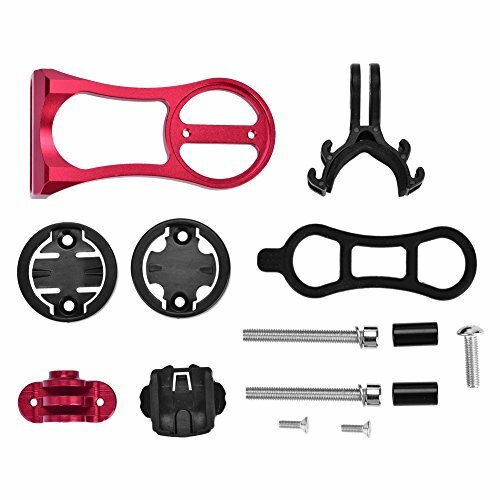 COMPATIBILITY:It is a extension mount holder for computer and sports camera and other accessories.